As for the solstices there are two of these too – winter and summer. Summer solstice (longest day and shortest night) 21st June. Falling on the 29th September close to the autumn equinox, Michaelmas marks the end of the old agricultural year and the beginning of a new one. It is the time when the harvest is in (or should be in) and when farmers traditionally pay their debts and renew their leases. In days of yore, after the harvest, the geese were turned out into the stubble fields to fatten up on the fallen grains of wheat or barley and one of them would be killed and eaten to celebrate Michaelmas. Hence its other name – Goose day. Hence also the header here. 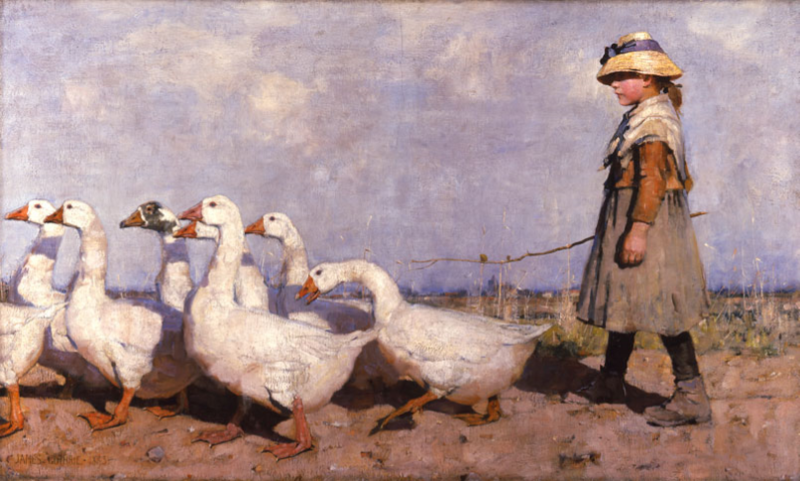 It is by the Scottish painter James Guthrie who painted it in 1883 when he was just 23. It is called ‘To Pastures New’ and hangs in the Aberdeen Art Gallery. That looks like a September sky don’t it though? And the little girl has her hat, shawl and boots on. I think she’s propelling those geese to the stubble fields. Presumably the geese would go in after the gleaners. The gleaners would be sent in to pick up the ears and grains missed by the harvesters. This picture below is ‘The Gleaners’, painted in 1857 by Jean-François Millet. It hangs in Musée d’Orsay, Paris. Click it for full size image. Now that’d wreck yer back I’d say! Michaelmas for the beekeeper, is more or less the same as for the farmer. The end of the beekeeping year comes with the honey harvest and preparations for the next year start with wintering. You need to have your winter preparations more or less complete by Michaelmas. 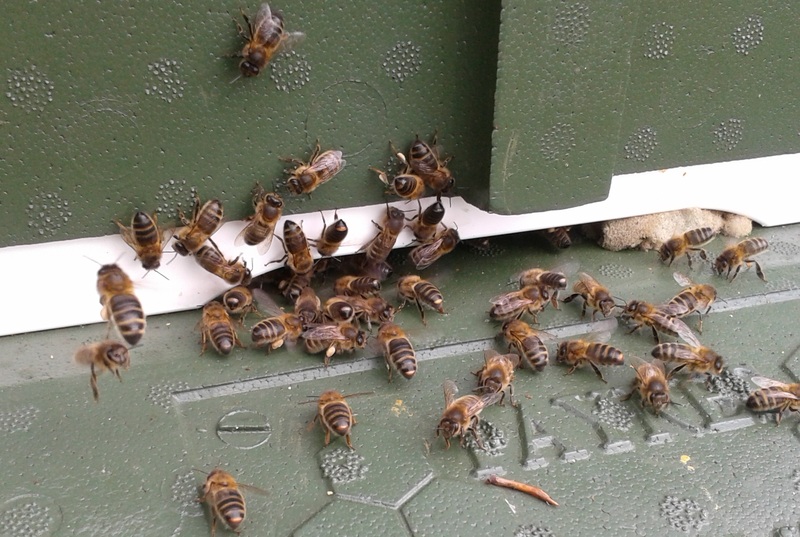 Your bees should certainly be fed and treated for Varroa. The Autumn equinox has passed so the nights will be getting longer and colder from now and the days shorter and they’ll be colder too. All the way to Christmas and beyond. Each time the temperature drops below 15 degrees centigrade the bees begin to cluster and become less and less active. This is why your Apiguard won’t work below 15 degrees so you’d better hope you’ve treated them by now. They have also evicted their drones by now so they don’t have those lovely big fat boys to help keep them warm either. The populations of worker bees in the hives are dwindling rapidly so what with that and the colder weather, it becomes more and more difficult for them to process syrup and ripen it for storage. 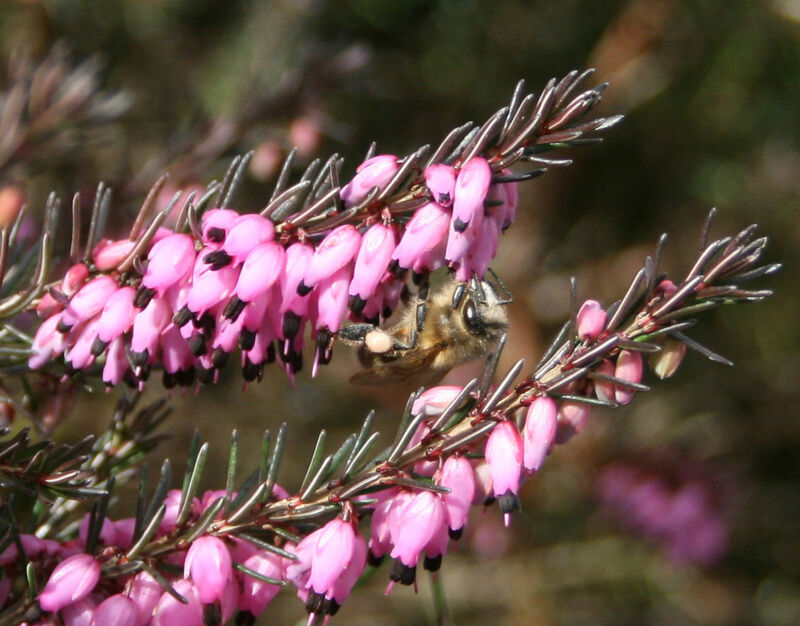 Hence a strong syrup (2:1) or special bee feed such as Ambrosia for autumn feeding – less water for the bees to get rid of. Remove it if they won’t take it down – it’s a big chilly thing to leave in a bee hive even if it doesn’t ferment. If they’re still a bit light you may need to give them fondant mid-winter. There is very little floral forage out there for the bees at Michaelmas – just the ivy, the dregs of the heather and some autumn garden plants such as Mahonia or the Michaelmas daisies. 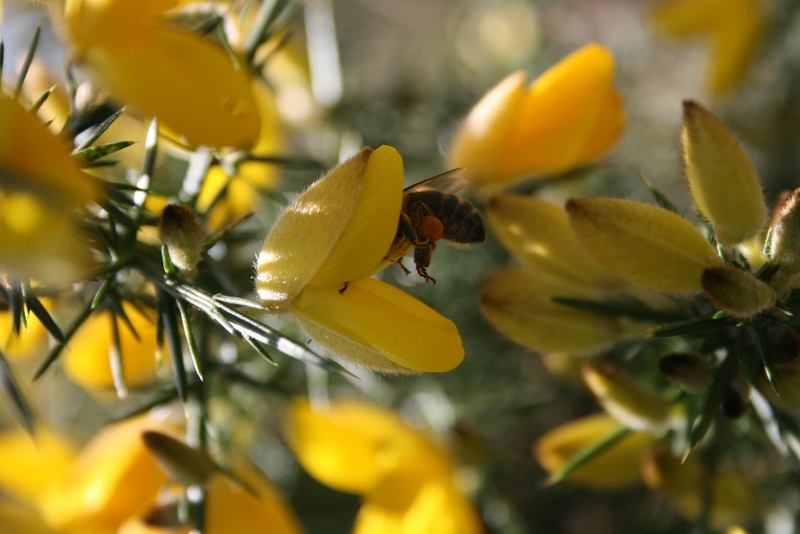 And there is always the gorse of course. The bees can bring in a surplus of ivy nectar if mild weather and the ivy flowers coincide but only pollen and a little nectar from the rest. Last year the ivy came into bloom in August and flowered all the way to November. The bees were strong after that fabulous summer of 2014 – will we ever forget it – and they worked the ivy well so they went into winter strong and well fed. A crop of ivy honey was almost inevitable and created its own problems this spring – but don’t start me. If spells of mild weather coincide with the ivy – we will know all about it. Perhaps prepare for a crop of ivy honey. Click here for how to take a crop of ivy honey. 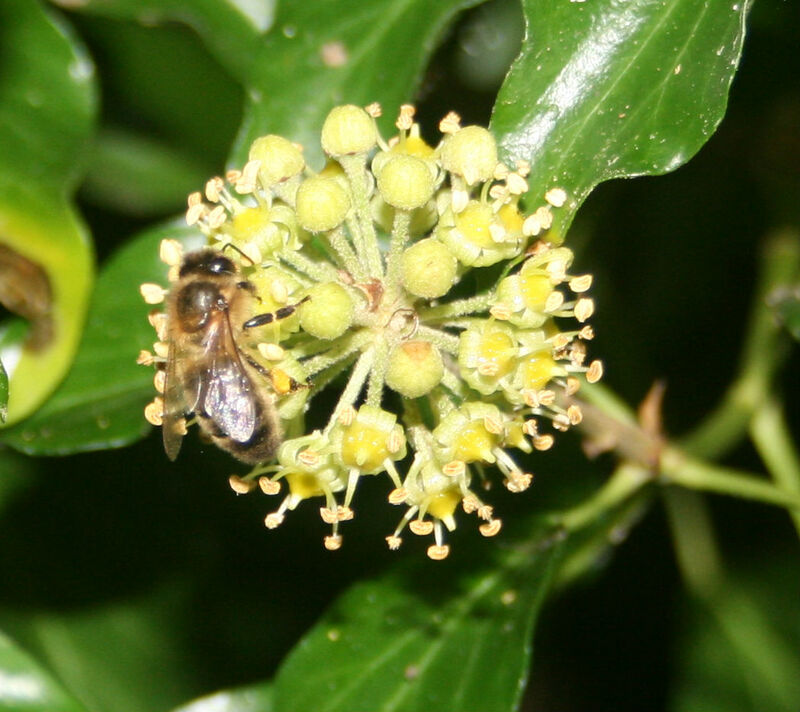 This year (2015) however, flowering is very late and it looks like there could be very little ivy honey this year. All the more important they are well fed beforehand – although the ivy is reasonably reliable it is not to be depended on. 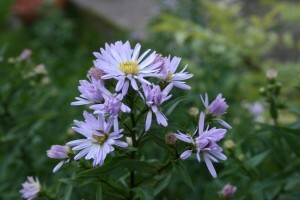 These are Michaelmas daisies. I just noticed they were coming out today – 29th September. Perhaps that’s where they get their name! The bees visit these for pollen and on a sunny autumn day they’ll be alive with bees. It can be difficult to summon the energy to prepare the bees properly for the winter but wintering prepares the ground for spring. Remember – the better you prepare your bees for the winter, the more you will have for next year.